Buildings swayed and a seismic alarm was set off in the capital, Mexico City, where rescuers have been trying to reach people who remain buried in rubble from Thursday's quake. Those rescuers have been forced to suspend their efforts. "I heard the alarm and ran downstairs with my family," said Sergio Cedillo, a resident who was watching rescue efforts when the alarm sounded. 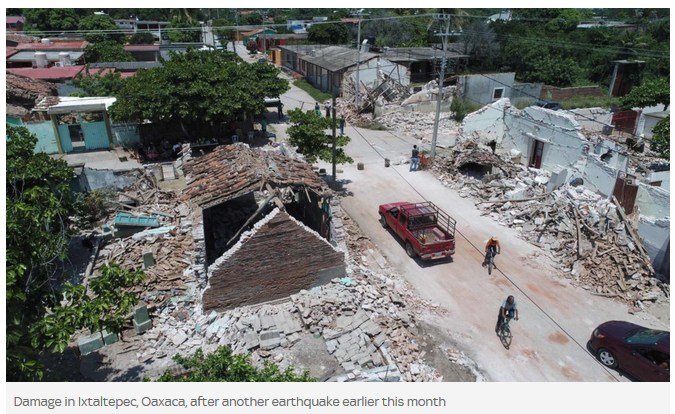 Alejandra Castellanos, who was staying in a hotel in the area with her husband, said she was "frightened" when she felt the earth shake for the second time in two weeks. "I was frightened because I thought: not again," she said. Southern Mexico was hit on 7 September by a huge magnitude of 8.1 tremor. The total death toll from the first two earthquakes is thought to be over 400. The Central American country suffers so much because of its position on a large grid of tectonic plates, on which all the Earth's countries and seas sit. It also falls on the 'Ring of Fire', a horseshoe shaped area around the edges of the Pacific Ocean, from Australia to the Andes, along which 90% of all earthquakes occur.